While many people would be reluctant to visit Pakistan, it is a beautiful country that has plenty to offer. One of the attractions you must visit is in Karachi, Pakistan’s largest city and its former capital. It is located on the shores of the Arabian Sea. There you can visit the Quaid-e-Azam’s Mazar, the mausoleum of the founder of Pakistan. It is a stunning construction made of white marble and North African arches. The Hingol National Park is ideal for trekking, and it has some stunning views, but the Khewra salt mines are not to be overlooked either. A train takes tourists through the mines where you can see sculptures made of salt. It is an incredible experience. One thing that you must keep in mind is that a trip to Pakistan entails obtaining a visa. But keep in mind that visas for Pakistan are among the most difficult to get. Pakistan’s visa policy names 5 countries whose citizens can enter the country without a visa. The stay period, however, differs depending on the nationality. Visas on arrival are available, but for business purposes and for tourist groups. 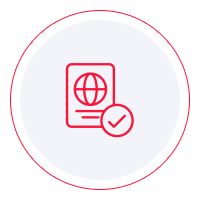 Visas on arrival for independent travelers are not available. All the other nationalities must obtain a visa from the nearest Pakistani diplomatic mission. To see which visa you are eligible for, you can take a look at Pakistan’s visa policy and look for your country on the lists. However, an easier method is using iVisa’s Visa Checker. The information you need is just a few clicks away. Click on the Visa Checker button located in the top-right corner, select your country of origin in the menu on the left, and choose Pakistan in the menu on the right. The result will display whether or not you need a visa, and if you do, you will get a list of the nearest embassies where you can apply. iVisa does not process Pakistan visa applications because electronic visas are not available, but we still want to be helpful, which is why our support service is at your disposal 24/7, and it is free of charge. Since you most likely need to get a Pakistan visa, you must see what the requirements are so that you can make sure you meet them. The internet is full of such information, but we recommend that you take it with a grain of salt and use it as a reference only. The information you find online is not always the most reliable. That is why our suggestion is to call the embassy or the diplomatic mission and ask them about the requirements. That way, you get the info you need from a reliable source. In the meantime, what we can tell you is that all travelers who plan a trip to Pakistan need a valid passport that remains as such for at least another 6 months from the date of arrival in Pakistan. We regret that we cannot be of more assistance with your Pakistan visa application process, and we hope that the information above is helpful. For further information, do not hesitate to contact us or the issuing authority.